Read Aloud Stories for parents and children to read together. Engaging stories communicate Biblical Truth. A great addition to your home library. 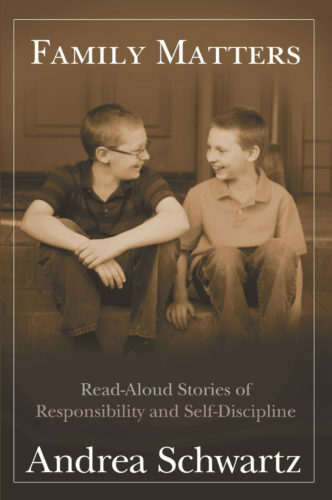 Unless children are trained in self-control and self-discipline early in their lives, they move into their adult years without a sense of personal, familial, or societal responsibility. They are unable to make mature individual decisions and they are unable to effectively disseminate the gospel message in obedience to the Great Commission. Andrea Schwartz, author of Teach Me While My Heart Is Tender, has again drawn from her family-life experiences to every area of life. These five stories focus on the necessity of responsibility and self-discipline in the "small things" working from the premise that, "Whoever can be trusted with very little can also be trusted with much" (Luke 16:10). The stories are meant to be read by parents and children together and serve as useful conversation starters to educate boys and girls so they can be effective citizens in the Kingdom of God.